This class stores measurement vectors in the context of n-dimensional histogram. Histogram represents an ND histogram. Histogram bins can be regularly or irregularly spaced. The storage for the histogram is managed via the FrequencyContainer specified by the template argument. The default frequency container is a DenseFrequencyContainer. A SparseFrequencyContainer can be used as an alternative. Frequencies of a bin (SetFrequency(), IncreaseFrequency()) can be specified by measurement, index, or instance identifier. Measurements can be queried by bin index or instance identifier. In this case, the measurement returned is the centroid of the histogram bin. The Initialize() method is used to specify the number of bins for each dimension of the histogram. An overloaded version also allows for regularly spaced bins to defined. To define irregularly sized bins, use the SetBinMin()/SetBinMax() methods. If you do not know the length of the measurement vector at compile time, you should use the VariableDimensionHistogram class, instead of the Histogram class. Compute a histogram from measurements. Examples/Statistics/Histogram.cxx, Examples/Statistics/ImageHistogram1.cxx, Examples/Statistics/SampleToHistogramFilter.cxx, SphinxExamples/src/Numerics/Statistics/HistogramCreationAndBinAccess/Code.cxx, WikiExamples/Statistics/Histogram.cxx, and WikiExamples/Statistics/SampleToHistogramFilter.cxx. Definition at line 77 of file itkHistogram.h. Definition at line 113 of file itkHistogram.h. Definition at line 84 of file itkHistogram.h. Definition at line 130 of file itkHistogram.h. Definition at line 128 of file itkHistogram.h. Definition at line 129 of file itkHistogram.h. Definition at line 127 of file itkHistogram.h. Definition at line 90 of file itkHistogram.h. Definition at line 110 of file itkHistogram.h. Definition at line 109 of file itkHistogram.h. Index type alias support An index is used to access pixel values. Definition at line 119 of file itkHistogram.h. Definition at line 120 of file itkHistogram.h. Definition at line 103 of file itkHistogram.h. Definition at line 99 of file itkHistogram.h. Definition at line 104 of file itkHistogram.h. Definition at line 102 of file itkHistogram.h. Definition at line 474 of file itkHistogram.h. Definition at line 89 of file itkHistogram.h. Definition at line 115 of file itkHistogram.h. Definition at line 87 of file itkHistogram.h. Definition at line 123 of file itkHistogram.h. Definition at line 124 of file itkHistogram.h. Definition at line 88 of file itkHistogram.h. Definition at line 114 of file itkHistogram.h. Definition at line 116 of file itkHistogram.h. Definition at line 106 of file itkHistogram.h. Definition at line 442 of file itkHistogram.h. Definition at line 454 of file itkHistogram.h. Definition at line 449 of file itkHistogram.h. Definition at line 461 of file itkHistogram.h. Get the maximum of the bin along dimension d corresponding to a particular measurement. Get the minimum of the bin along dimension d corresponding to a particular measurement. Is set to false if the bins at edges of the histogram extend to +/- infinity. Get the frequency of a dimension's nth element. Get the measurement a bin along a specified dimension. This is the midpoint of the bin along that dimension. Get the measurement of an instance identifier. This is the centroid of the bin. Get the measurement of an index. This is the centroid of the bin. Reimplemented from itk::Statistics::Sample< Array< TMeasurement > >. 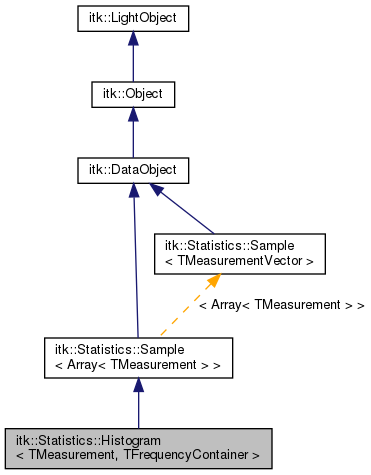 Implements itk::Statistics::Sample< Array< TMeasurement > >. Increase the frequency of an instance identifier. Frequency is increased by the specified value. Returns false if the bin is out of bounds. Increase the frequency of an index. Frequency is increased by the specified value. Returns false if the bin is out of bounds. Increase the frequency of a measurement. Frequency is increased by the specified value. Returns false if the measurement is outside the bounds of the histogram. This function performs a dynamic allocation for the index length, and should not be used in tight per-pixel loops. Initialize the histogram, generating the offset table and preparing the frequency container. Subclasses should call this method in their Initialize() method. Initialize the histogram using equal size bins. To assign bin's min and max values along each dimension use SetBinMin() and SetBinMax() functions. Definition at line 481 of file itkHistogram.h. Get the pth percentile value for a dimension. and pb = frequency of the bin / total frequency of the dimension. Set to false to have the bins at edges of the histogram extend to +/- infinity. Set the frequency of an instance identifier. Returns false if the bin is out of bounds. Set the frequency of an index. Returns false if the bin is out of bounds. Set the frequency of a measurement. Returns false if the bin is out of bounds. Definition at line 492 of file itkHistogram.h. Definition at line 476 of file itkHistogram.h. Definition at line 487 of file itkHistogram.h. Definition at line 484 of file itkHistogram.h. Definition at line 477 of file itkHistogram.h. Definition at line 475 of file itkHistogram.h. Definition at line 471 of file itkHistogram.h. Definition at line 490 of file itkHistogram.h. Definition at line 489 of file itkHistogram.h.